I've been meaning to make some zero waste dishwasher detergent for a while now. Whenever my mom loaded up the dishwasher, I always cringed at the detergent she used. It was full of questionable ingredients and costed a lot of money, not to mention packaged in plastic. Surely, there had to be a better way. I combed the internet for an efficient option that didn't hurt the environment, our health, or our wallets. And then it hit me: DIY Dishwasher powder! This powder is so easy to make, it's full proof. Plus, it's an all natural dishwasher detergent that only consists of ingredients I trust and can source plastic free. Want to make your own eco dishwasher powder? It's so simple. No, literally, it's almost stupid simple. It'll take you only five minutes to whip up, if that long (took me about a minute). Plus, it doesn't leave any residue on your dishes. Ready to give it a try? Here's how to make some zero waste dishwasher detergent. Funnel all the ingredients into a jar, cover with a lid and shake well to combine. That's literally it! It's ridiculously easy to make. 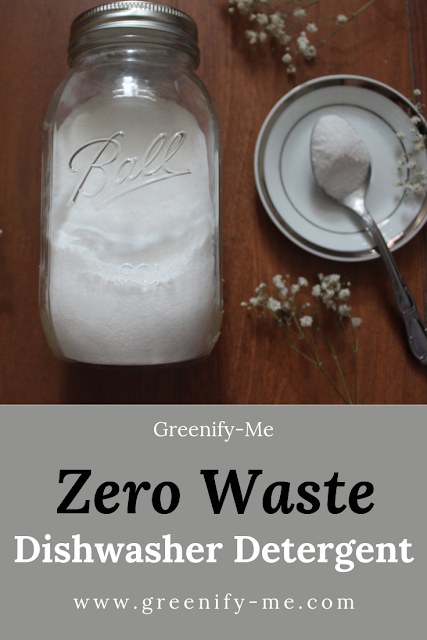 It's super simple to use this zero waste dishwasher detergent. When you're ready to use it, spoon 2 to 3 scoopfuls into your dishwasher. Close the compartment and do a load of dishes as normal. Just make sure to avoid getting any water in the container you store this zero waste dishwasher detergent in. If you do, it will activate the citric acid and get kind of messy. If you like using a rinsing agent as well, place a small dish of white vinegar (1/8 to 1/4 cup) on the top rack of your dishwasher. I personally don't feel it needs this extra step, but that's up to you. My dishes came out sparkly clean after using this! I was super satisfied with the job this powder detergent did. Also, little fun fact, newer dishwashers save more water than washing dishes by hand. So, if you're looking for another reason to give this DIY a try, you just found it. Storage: Keep this in a dry, dark area. A cleaning caddy or cabinet works well. You can also keep it under the kitchen sink for easy access. Personally, I'm currently storing it right under the kitchen sink. It's located right next to my dishwasher, so it makes my life a lot easier. Everything's in one place! Will you be giving this zero waste dishwasher detergent a shot? What's your favorite zero waste way to clean dishes? For more zero waste cleaning tips, be sure to check out my favorite all purpose cleaner, Orange Peel Vinegar or my zero waste toilet cleaner, Citrus Toilet Fizzies. This recipe has worked better than my bought Ecover tablets. Thank you so much this is going to save loads of money and it gives me great satisfaction to make my own. Oh I'm so glad you love it! :) That makes me so happy. It definitely will save you money! Making your own products is definitely more satisfying. Thanks so much for commenting! Hi! I tried making this and am wondering if I'm doing something wrong. When I put the powder in the detergent compartment, it just got completely caked and the dishes did not get cleaned. Are you supposed to put this detergent elsewhere?